Greetings from London! All week the FT has had feature stories on this topic and Friday’s was another must read entitled “Do Not Let The Cure Destroy Capitalism.” The authors suggest that much of the reponse to the problems have been midguided. They identify “three basic flaws in the current approach to the crisis. They are an overly broad diagnosis of the problem, a misconception that market failures are readily overcome by government solutions and a failure to focus on the long-run costs of current actions.” They urge the powers that be – ‘do not deviate far from a market-oriented global economic system that has served us well for 30 years.” Although I do not agree that the system has in fact served everyone well, it has not, I do still fundamentally believe in capitalism as an economic system. Or should I say capitalim with appropriate controls and oversight. AIG bonus craziness. I understand why people are upset. I understand why many feel that money should be paid back, but it is completely unacceptable what is going on. It is completely unacceptable that some dude in Washington should be allowed to keep his job after saying that the people who received bonuses should go committ suicide. I don’t care if he did not mean it. He should be gone. Period. End of story. As for taxing people 90% on their bonuses. That is the most ridiculous thing I have ever heard and likely unconstitutional. Perhaps, perhaps for companies where the government is the majority shareholder, but they are NOT for almost all of these companies. Yes have oversight but these companies have to be able to run their businesses and the upset caused by this will be devastating and besides, it is just not right. All people who work in financial services are not responsible for the mess we are in. If we MUST finger point then let’s point it right back to Washington. It is the responsibility of government to look after the rights and needs of the people and the failure of proper oversight of the sector was mindblowing. Now, NOW, they want to pass the blame and publically flog every wall streeter they can get their hands on. This language, this behavior, has to stop or their will be riots in the streets. It has gone way too far and risks going even further if the leadership of this country does not say… ENOUGH. 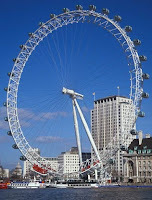 Pictured is the London Eye… very cool I must say. Next Post Market Moves Up and ‘Women Better Fund Managers Than Men"